We are all stuck with each other on this planet, so we might as well learn from each other and be willing to share our expertise. 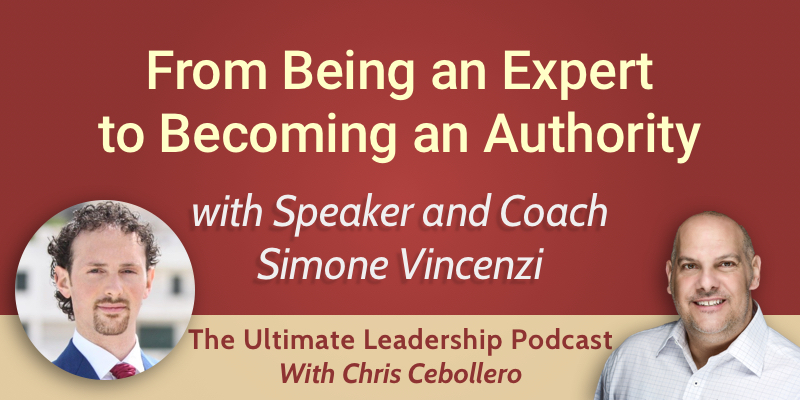 A firm believer in the power of mentorship is my guest and good friend, Simone Vincenzi. Join us as we explore the unlimited possibilities of what a good coach has to offer. Simone is motivated by serving his clients. He is helping experts become authorities in their fields, and this is what makes him happy. He doesn’t want to work all the time. His solution to a good work-life balance is focusing on work when he is working, and focusing on relaxing when he is on holidays. Simone also makes sure he carves out pockets of time for his wife. After reading “The ONE Thing: The Surprisingly Simple Truth Behind Extraordinary Results”, Simone understood the importance of scheduling and prioritizing. The book talks about different ways of scheduling your time and finding out what’s really important to you. It classifies activities as being “rubber” or “glass”. Rubber activities can be postponed, they are not made of glass. Glass activities can break, and relationships and family belong to this category. Entrepreneurs often feel that they never have enough success. Simone has also fought with this feeling for a long time, and he needs to constantly remind himself that he has enough success. When you’re very passionate about what you do, opportunities open up everywhere. You feel like you don’t want to miss out on anything. Sometimes you just have to stop for a moment and feel good about your work. We come up with the best ideas when we don’t actively think about solutions. Simone noticed massive differences in leadership development between the US and Europe. In the US, people tend to be go-getters. In Europe, they are more relaxed, sometimes too relaxed. He moved from Italy to London, because he finds London much more similar in terms of mentality to the US. In Italy, people love complaining, without really seeking a solution to their problems. In the US, there is an active approach when it comes to leadership development. In Europe, the approach is more reactive. However, the trend seems to be changing nowadays. If you don’t grow, you die. We are in this together. Unfortunately nowadays we are getting more and more isolated. With technology, we have the false feeling that we are more connected, while in reality we are more and more disconnected. Together we can achieve greater things. On his podcast, Explode Your Expert Biz Show, he interviews leaders and experts and asks them for tips and strategies on how to grow a business, particularly one based on personal brand. The show is full of practical, implementable steps.